Keeping your smile looking great is important. 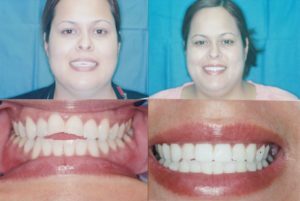 When minor chips, discoloration, or spacing irregularities occur, you should not have to deal with a difficult and expensive dental procedure to return your smile back to normal. Luckily, cosmetic bonding exists to restore the small issues that crop up. 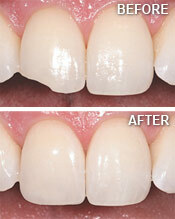 Cosmetic bonding is a great option for when you have a small problem and need a quick and easy fix. Benefits include a lesser cost, a perfect match in coloration and shine to the rest of your teeth, and a pain-free, short procedure. 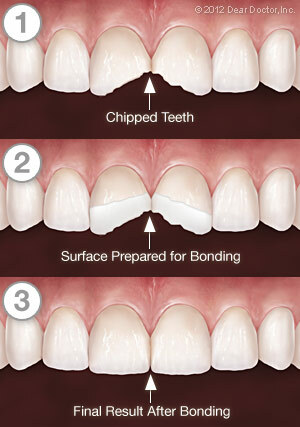 Cosmetic bonding is actually a rather simple procedure and can be done in one visit to the dentist. Essentially, your dentist will choose a resin that matches the color of your tooth, attach it, and then mold it to the shape of a tooth. However, before he or she adheres the composite resin, they will clean the affected tooth of any plaque, apply etching gel, and rinse this acidic gel off. The composite resin is then applied layer by layer until your tooth has the desired mold and shape. Your dentist will then harden the resin with an ultraviolet light. Once hardened, the final step occurs: a last trim in case the shape is not exact and a polish to make sure the bonded material matches the rest of your teeth. Depending on the severity of the damage, you should expect this procedure to last up to an hour. Unlike other dental procedures, when you utilize cosmetic bonding, there are a couple of steps you will need to take to make sure your bonding lasts for a long time. Despite the benefits of cosmetic bonding, the resin can stain, especially during the first 48 hours. Therefore, you will need to avoid drinking things such as tea, coffee, and red wine, as well as smoking cigarettes or eating anything that stains for the first couple days after the treatment. Aside from stains, the resin is not as strong as a natural tooth. Clearly, you will still be able to eat and use your teeth for everyday things. However, it is important to be mindful of the fact that part of your tooth is made of a different material. Doing things like biting your nails or holding pens in your mouth can negatively affect the bonding. Overall, just not being too rough with your teeth and daily brushing and flossing ought to protect your cosmetic bonding treatment. Minor problems with your teeth can leave you feeling less confident in your smile. If you want to look and feel better, call Dental Professionals at (773) 327-4442. We can offer you a free consultation so you can see how you would look if you took advantage of our cosmetic bonding treatments!